Kool-Aid is an American soft drink powder. It is available in the UK but it takes a bit of tracking down. If all else fails there are plenty of suppliers on Ebay and Amazon. Experiment with the different flavours/colours to see what works best. 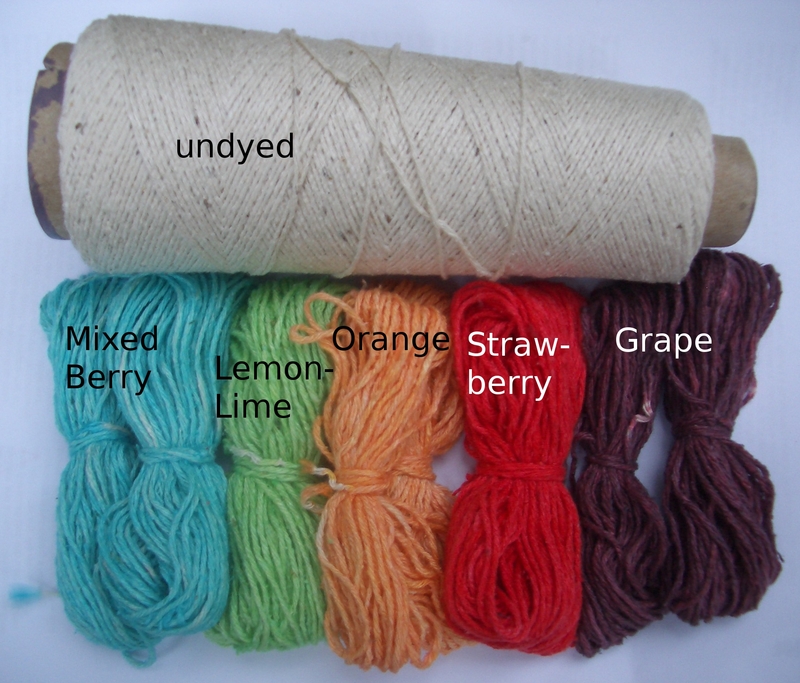 This method is suitable for dyeing small amounts of yarn, eg to provide the accent colours for a pattern such as Leftie. It becomes expensive to dye with Kool-Aid for large quantities of yarn. The basic dyeing method is the same for other protein fibres, including wool, although there isn’t the same need to keep the temperature below 80°C. However, wool that is not Superwash treated must be handled carefully (no sudden or repeated temperature changes, minimal agitation) to avoid felting. Measure the length of the silk yarn(s) you are going to dye – I wrap yarn around a metre-long measuring stick, count the number of wraps and double it. Then work out what weight of fibre this represents, using the information on the ball band which should say how many metres/yards are in a full ball/skein. Alternatively, if you are dyeing more than say 2oz/50g or have access to scales that will weigh smaller quantities, just weigh it. Wash the skeins gently in warm water with a little detergent added – washing up liquid or baby shampoo is supposed to be better for silk than soap flakes or laundry detergent. Rinse them in warm water until the bubbles have gone, then leave them to soak for 12-24 hours in a lidded, oven- or microwave-proof glass dish containing just enough warm water to cover them and a splash of distilled (colourless) malt vinegar. If necessary, use something inert (eg a stainless steel spoon) laid over the top of the yarn to keep it all below the surface of the water. You’ll need 1-2 sachets of Kool-Aid per 25g/1oz of yarn for deep colours (more with some flavours such as Lemonade), about half that amount for pastel shades. There’s only about 4g in a packet which makes weighing out small quantities impossible unless you have super-accurate scales, so dilute a full packet in warm water to make 100ml of solution and then it’s easy to get the right amount by measuring out the liquid – a teaspoon holds about 5ml or you probably have a set of measuring spoons in a kitchen drawer. But there’s no need to be precise unless you’re aiming for reproduceable results, and if in doubt go for less, you can always add more later (see step 7). Lift the silk skeins out of the glass dish and leave them temporarily on the upturned lid while you add the Kool-Aid powder or solution to the soaking water and stir it well with a stainless spoon. The powder must be fully dissolved. You shouldn’t need more water to cover the yarn, but add some from the kettle if you are having trouble getting the Kool-Aid to dissolve. (NB. It is the ratio of Kool-Aid to fibre that matters, not the strength of the dyebath, adding more water will not result in a paler shade.) Then put the skeins back in and give them a gentle stir to distribute the dye liquor through them. Now the dyebath needs to be heated, but to no more than 80ºC (175ºF) or the silk could lose its lustre. Heating can be done in a microwave, over a pan of water (bain marie) on the hob, in the oven or in an electric slow-cooker. Whichever method is used, the temperature should be monitored closely, ideally with a thermometer (eg a meat probe or a jam thermometer), but if you don’t have one then you will just have to judge the temperature from the amount of steam (or water vapour, strictly speaking, since we are below boiling point) given off, the number of bubbles rising to the surface, how hot the glass dish feels to the touch, etc. I use a microwave and give the dish successive bursts of 30 seconds on high to start with, checking the temperature with my hands and eyes after each one. As the temperature gets to the point where the dish is too hot to hold, I ease off. The aim is to keep the dyebath at or close to 80ºC until the bath clears or the yarn has turned an acceptably deep shade. Silk, unlike wool, doesn’t felt so there is no need to worry about the temperature going up and down repeatedly, which it may do with the microwave method. If the dyebath exhausts (turns colourless) before the yarn is dark enough, no problem, just use more Kool-Aid and repeat steps 5 and 6. Allow the yarn to cool completely in the dyebath. If the dye had not exhausted completely when it was hot, more colour may attach itself to the fibre during the cooling stage. Rinse the skeins in warm water, then wash with a little detergent and rinse until the water runs clear. Gently squeeze out the skeins and blot them in a clean towel. 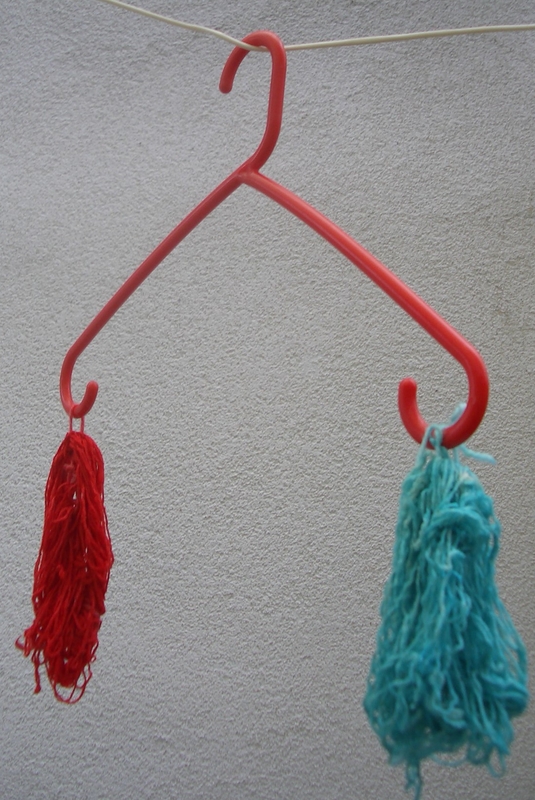 Hang them up to dry out of direct sunlight but preferably in the fresh air to get rid of the fruity smell. When the yarn is still a little damp, untie the skeins and wrap the yarn reasonably tightly around a lemonade bottle or something similar to finish off drying. This should ensure that it ends up kink-free. Any unused Kool-Aid solution can be kept in a jam jar to dye another day. Label it with the flavour and what proportion of a packet it contains.